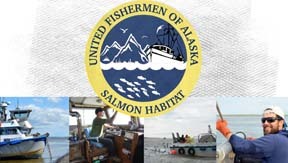 United Fishermen of Alaska (“UFA”) is the statewide commercial fishing trade association, representing 36 Alaska commercial fishing organizations participating in fisheries throughout the state and its offshore federal waters. UFA’s mission is to promote and protect the common interest of Alaska’s commercial fishing industry, as a vital component of Alaska’s social and economic well-being. The Office Manager is responsible for general office work including membership correspondence, bookkeeping, filing of paper and electronic records, meeting preparation, and staff support to the Executive Director. The position is based in Juneau, Alaska. Provide technological and research support for UFA President and UFA Executive Director. Maintain online accounts and services, including but not limited to; email accounts, State of Alaska Revenue Online, Mailchimp, USPS ImSB bulk mail, Alaska Airlines EasyBiz, Fidelity IRA Plan Manager, IRS EFTPS, etc. Complete timely required filings and maintain records for state and federal agencies. General bookkeeping including reconciling monthly bank statement and monitor cash flow. Software tools include Microsoft Office including Outlook, Word, Excel and Publisher. Quickbooks, data export and import, mail merges, USPS ImSB small business bulk mail, and Microsoft Access experience a plus. This job requires a positive can-do attitude, ability to work independently to produce high quality work products, and manage multiple projects at once. Ideal candidates will have 1-3 years of relevant Office Manager experience. Successful candidates will have excellent oral, written and interpersonal communication skills. Must possess strong organizational, critical thinking and analytical skills, as well as an attention to detail. Ability to manage multiple projects and meet deadlines is required. Also essential is a high level of individual initiative and creativity. To be determined based on experience and qualifications. Benefits include 3% IRA match, as well as Medical/Dental/Vision health insurance plan with a Health Savings Account contribution. Applications including resume and cover letter should be emailed to Frances Leach, Executive Director, at director@ufa-fish.org (please include Employment Application in the subject line). Applications must be received by 5:00 p.m., April 29, 2019.